I rarely harp on round-ball matters here for obvious reasons, but I’ll start this preview by pointing out that my fav club teams in both rugby and soccer have enjoyed similar fortunes of late. To name just three, both Leinster & Spurs were beaten to league titles last season by teams considered rank outsiders (Connacht & Leicester), both are looking forward to big semifinals on the same weekend against teams beginning with C (Clérmont & Chelsea), and within the space of four days, both had vital league matches scheduled in the Liberty Stadium in Swansea. 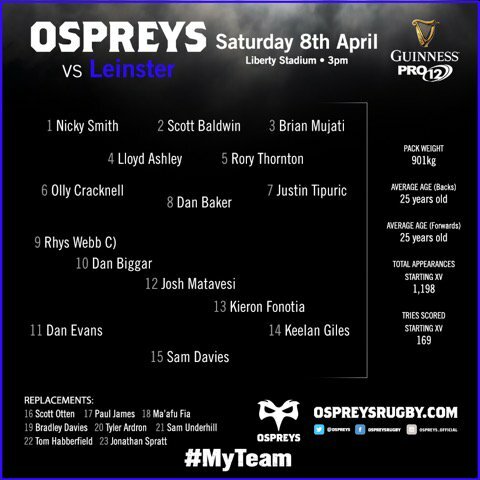 Something tells me the crowd numbers for Ospreys v Leinster on Saturday might be a tad below those for the Premier League fixture, but even though Spurs left it very, very late to win on Wednesday, I’d definitely take a similar result for Leo Cullen’s men. As wonderful as our European adventure has been, I certainly wouldn’t want to sacrifice our League title aspirations for it; I’d like to think we have plenty of depth to cope with the tough schedule we have ahead. Like I have said many times this season, a “top two” finish is a minimum requirement for us and none of our final four regular season matches are even remotely “easy”. 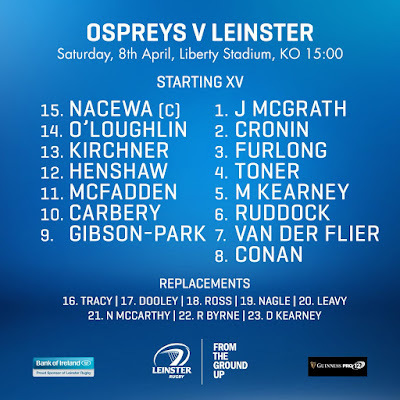 This is an interesting Leinster selection, with more returning to the lineup from injury. 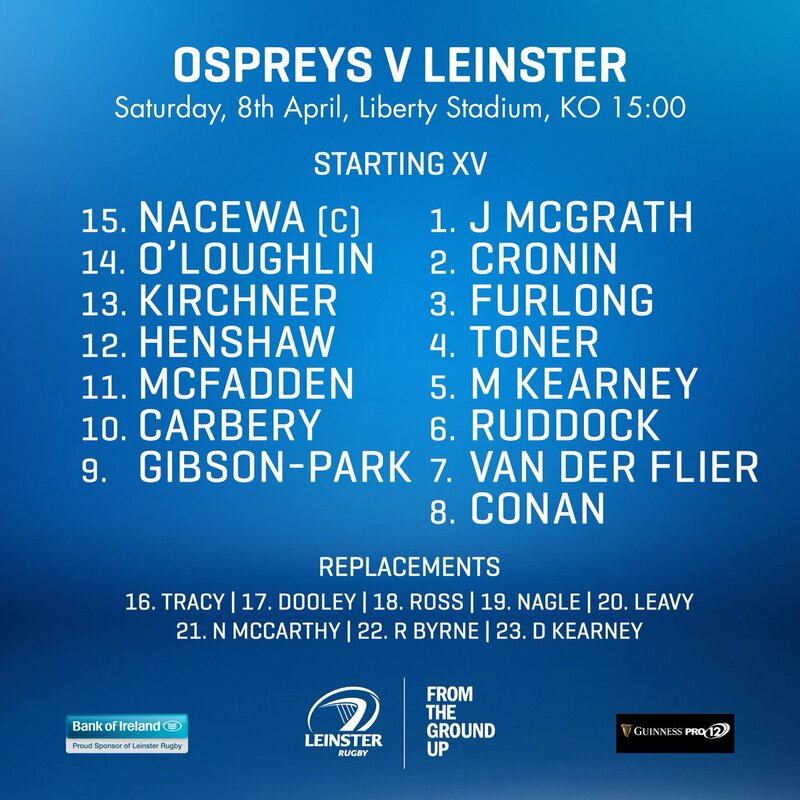 Many will raise an eyebrow at seeing Rory O’Loughlin on the wing and Kirchner at centre - based on past combinations you’d think their roles would be reversed, but maybe Rory’s spell on the sidelines has played a factor? But the returning name I’m happiest to see is that of Sean Cronin - it was a really unfortunate knock in a match that was already well won that had him out for so long and after a rehab appearance in the A team last weekend, he’s back in time to put himself in contention for Lyon, and here he finds himself with Ireland’s starting test props either side of him. The Ospreys have an international combination of their own on show, namely that of half-backs Rhys Webb and Dan Biggar. Their ability to control the game could be key. And facing them we have Jamison Gibson-Park and, after his man-of-the-match display last weekend at 15, Joey Carbery at out-half. He’ll need to show all his attacking options early and keep the home defence guessing. Of course the back row will be a battle and this time we’re sending out Messrs Ruddock, van der Flier and Conan to face the likes of Tipuric and Baker. Once more the league in their infinite wisdom have sent an Irish ref (John Lacey drew the short straw this time) for a match like this; no doubt an interesting series of tweets from Welsh fans will follow his decisions especially at the breakdown!!! It’s a very strong bench the home side have, especially in the forwards with Paul James, Bradley Davies, Tyler Ardron and Sam Underhill part of a 6/2 split and all capable of imposing themselves in the closing stages. But we have said that of this contest before and the danger never materialised - besides, our replacements include Dan Leavy so we should be well able for them.